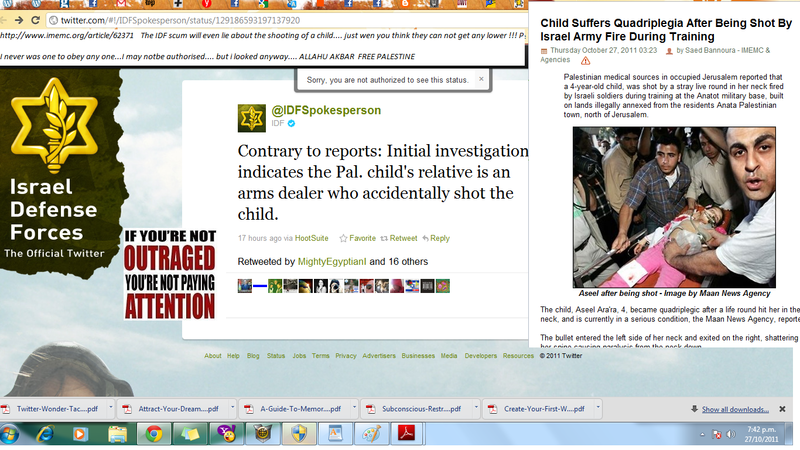 IDF Scumbags caught out in yet ANOTHER LIE!!!! Palestinian medical sources in occupied Jerusalem reported that a 4-year-old child, was shot by a stray live round in her neck fired by Israeli soldiers during training at the Anatot military base, built on lands illegally annexed from the residents Anata Palestinian town, north of Jerusalem. The child, Aseel Ara’ra, 4, became quadriplegic after a life round hit her in the neck, and is currently in a serious condition, the Maan News Agency, reported. The bullet entered the left side of her neck and exited on the right, shattering her spine causing paralysis from the neck down. Sung in the evening of Simchat Torah Rabbi Minister alphabetically ( I think it means the Rabbis lists the massacres of Arabs) – House and the audience responds. “Great day for Israel goddamn day Ishmael,” and the crowd sang the rabbi replies: “happy day, happy day, happy day for Israel”. 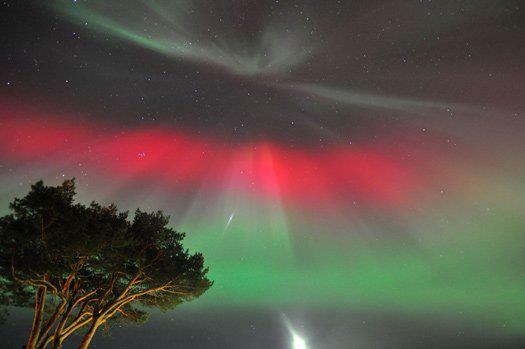 Subhanallah-And the glory of the Palestinian colours shone in the northen sky…The voice of God saying “Hear me o Israel, Palestine shall be set free!!! 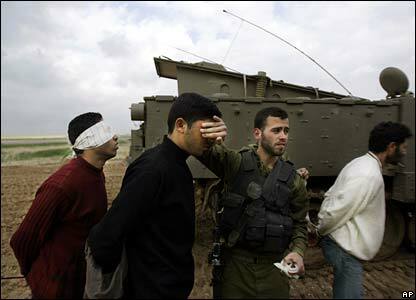 ZThere was an explosion targeting Zohair Sheshia a Palestinian released in the prisoner exchange. 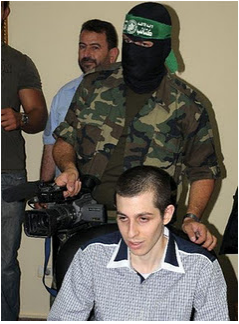 a Palestinian released in the prisoner exchange. 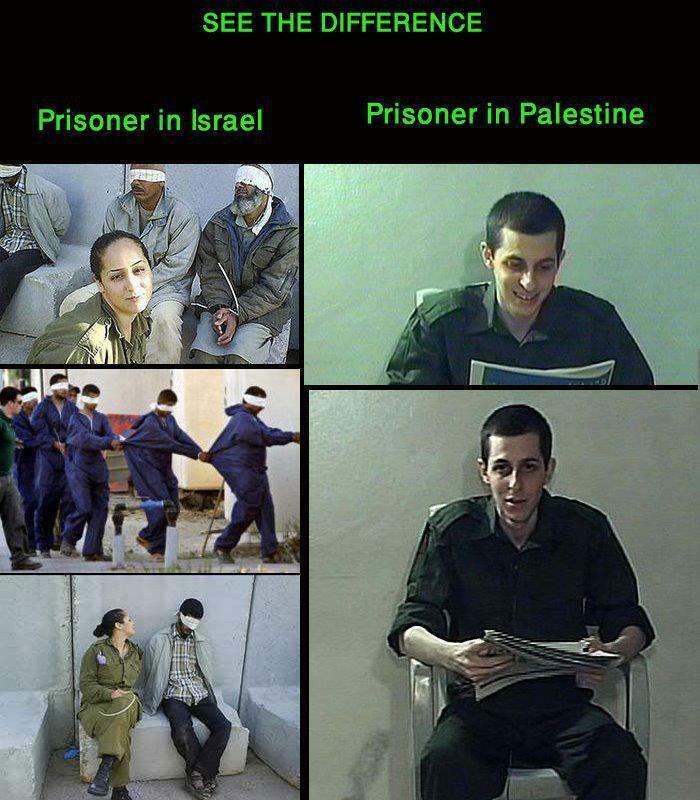 Waiting for more information, please circulate to your contacts … this could get really dangerous … 2 days and the f*cking zioninists have started targeting those in the prisoner exchange.Please share this news around……There is no make peace with such monsters!!! Shalit says: I smell the air and see the sun and all that I know I am on the globe. I did not know the name of one of Kano Inado some (one Hamas – Hamas 2, and so … etc. I looked at this photo for along time trying to decipher what it said.Then I noticed the hand on Shalits shoulder..it rests reassuringly on Shalits shoulder.In fact I even focussed on the hand and blew it up to make sure of what I saw.There is no tension in that hand, it just resting there.One could say it was giving comfort to Shalit in his first public interview in the five years since his capture. So I noticed this lately…..apparently when it comes to Israel Twitter is monitoring my account…when it wouldn’t let me post this tweet I did some experimenting…nice to know I have annoyed the Zionist enough they have to monitor me…..Allahu Akbar!!!! Court rules it is allowed to call Jews thieves. Its always handy to have knowledge of of Israel’s laws in relation to activism.This item in “YourJewishNews” is definitely worth remembering… An Israeli court hasd ruled it is allowed to call Jews thieves as long as its a metaphor for exploitation. Calling Jews in Judea and Samaria “thieves” is legitimate criticism and not slander, according to Justice Shoshana Almagor of the Tel Aviv Magistrates Court. Almagor rejected a slander suit brought by Moshe Zer against far-left activist Gidon Sapiro. Sapiro had termed Zer “one of the biggest land thieves in the occupied territories,” an accusation Zer said was untrue – all his land dealings have been legal – and harmful to him as a businessman. Sapiro argued in court that the word “thief” was meant as a metaphor for exploitation. The word “thief” was not a personal insult directed at Zer, “but rather, an expression meant to raise questions as to his behavior and the nature of land dealings between Arabs and Jews in Judea and Samaria,” Almagor ruled. Sapiro’s attorney expressed satisfaction with the verdict, while Zer accused the court of arbitrarily deciding that an insult was actually a metaphor.